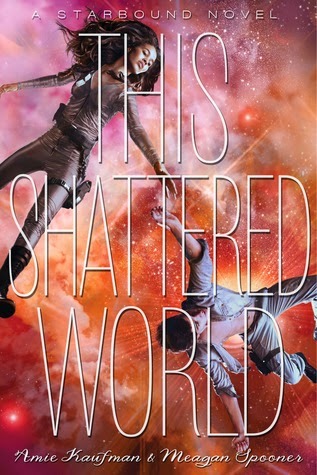 I don't even think I could start to tell you how excited I was getting This Shattered World for review because These Broken Stars was one of my FAVORITE reads of last year and I could not wait to see how this companion novel not only progressed the story but *crosses fingers* connects our beloved Tarver and Lilac. (Sidenote: SWOONING just thinking about all the epic that was These Broken Stars but I digress) So, the story of Jubliee and Flynn is on Avon, a planet made of swamp and muck that makes most soldiers go rage crazy from a disease called Fury making the turnover of these soldiers quick. Jubliee is a Captain and has been on Avon for over a year which is unheard of but the Fury doesn't affect her. She's minding her own business in a bar when hey, hey, hey, she's kidnapped by a native of Avon--Flynn. From there, we move on to sacrifices and escapes, duty versus love, and doing what is right not doing what is easy. Le sigh. Like I briefly mentioned about, the story is steeped in subterfuge and alliances nobody in this world would believe. Flynn is a native of Avon and just wants better for his people in the most peaceful way possible. All Jubilee knows is military procedure and following and giving orders. Together, these two shouldn't make any sense. But they both have things in their past that connect them in more ways than either of them could have known. I love stories that have characters questions what they've been led to believe. In this case, it's Jubilee with her mission on Avon and what is really going on with this planet. She questions what really is best and how the native people are being treated. Flynn goes against all odds and believes in her desire to understand and change. The dynamics of this plot and the politics of it all is rich in detail and intrigue. Nothing is at is seems on Avon and I felt like I was back with Tarver and Lilac trying to figure out what in the hell was going on in this bayou of deception. I can't give too much away on plot but know that things are amiss, things get crazy, and things are spectacularly sic-fi. I loved it all and I could not put it down. The relationship between Jubilee and Flynn is tenuous to say the least. They are most definitely star-crossed, le sigh, and most definitely on opposite sides of this war and battle for supremacy on Avon. So, understandably, their relationship is one built on understanding and trust in the most epic sense. They have no other choice than to believe they are crazy for trusting the other in a place that would kill them quicker than they could blink. I find this so incredibly beautiful how two different yet similar people, on opposite sides of this battle, could find a way to not only stop and listen to one another but start to understand and love one another. There are moments towards the end when my heart just felt like it was going to burst. Jubilee has tragedy in her past that we don't know exactly what happened. Flynn has his share of loss as well. What I loved was that Flynn was the first to bend. He felt more emotional of the two and more in tuned with his feelings of what was right and his judgement of character. Jubliee took a little longer to get there having dealt with her tragedy in the form of drills and proving she can be the best. If their roles were reversed I'm not sure the story would have turned out so romantically. Flynn was there to help Jubilee along the way in the feels department having deprived herself of them for so long. This broke my heart but I completely understand where she was coming from and it worked perfectly for her character and the story. Flynn's belief in her was a turning point in the story and I loved seeing how it progressed from there. This story is badass and beautiful and oh so romantic. The setup for the final book has my head in the intergalactic clouds with wondering WHAT is going to happen, HOW it will all end, and WHO will be star-crossed in the final book. I cannot say enough with how excited I am to see where the story ends (sad!!!) and how all the pieces of the puzzle will fit together. IS IT NEXT YEAR YET?!?!? While I was definitely invested in the story and wanted to keep reading to find out what happens, I felt like the beginning was a little slow and not as easy to get into as the previous book. I understand why everything needed to happen as it did but I found myself struggling a little in the beginning to become fully invested. Once we got all the major players and a sense of the plot and conflict, it flew by but up until that point I found myself wanting to get the story going. If you love star-crossed love, fighting for what is right, shutting down an intergalactic oppressor, and ALL fans of the Starbound series...then this book is for you.